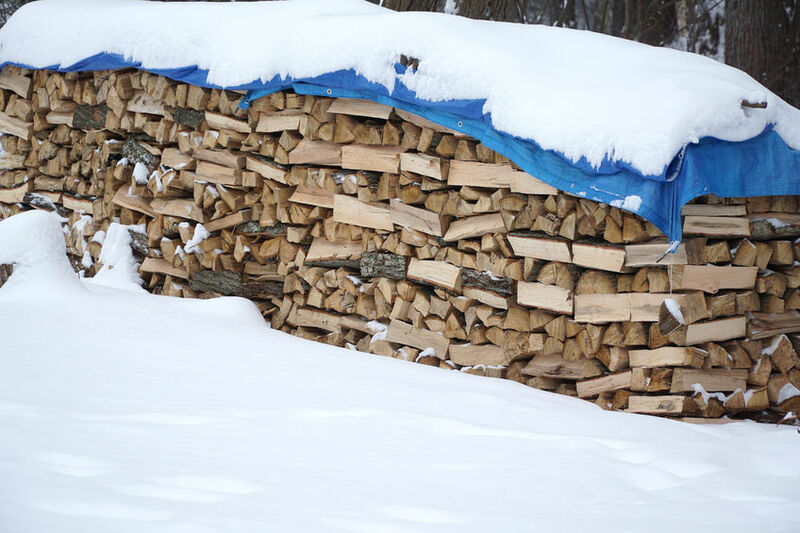 Understanding how to stack firewood is important to keep it dry and away from insects. Throwing a bunch of split firewood in a pile and coming back to it in 6-12 months is not how you want to store it. Firewood that comes into contact with the ground is exposed to the moister it picks up from the earth. This moisture will start to decay the wood and prevent it from properly seasoning. Moisture also promotes mold and fungus growth on the wood which could be unhealthy to bring into your home. Insects will also invade the wood if its lying on the ground. Spiders, especially the dangerous black widow spider, like to build nests in piles of wood left on the ground. I cut down a big maple tree once and left a pile of logs sitting in the woods for about a month. I came back to split the wood and load it in my truck. When I picked up a piece that was laying the ground I found a large black widow nest full of hundreds of baby black widow spiders and of course the adult. Unless you're stacking directly on concrete you should start off by laying a couple 2x4's on the ground parallel to each other about 12-14 inches apart. 2x4's work good because they get the wood off the ground and they are inexpensive. Wooden pallets also work good. Next, lay the wood in a row on top of the 2x4's. Stack the wood tight together to make it stable. The row can be any length but try to limit the height to around 4 feet. Anything taller could get unstable and fall over. If you don't have a tree or a post on each end of the pile you will have to taper the ends back gradually to prevent an avalanche of sliding wood. Using a metal t-post pounded in the ground on each end works well and they're fairly cheap to buy. Stacking the wood in a criss cross pattern, like a log cabin, works well too. It tends to be more stable that just stacking it in a row, plus it gives better air flow to the wood allowing it to dry quickly. You can use this method to make end supports to replace the metal t-posts. 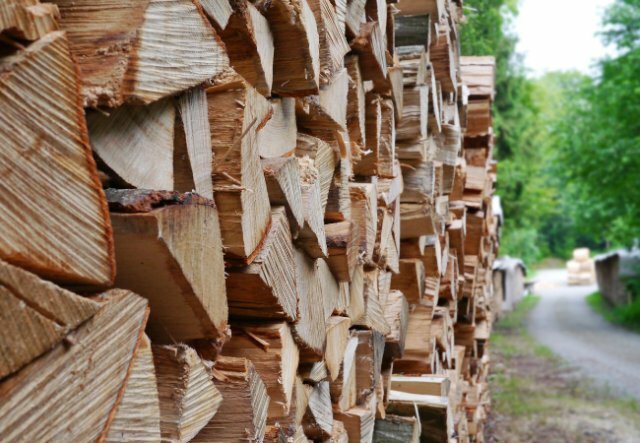 If you're stacking more than one row of wood, keep the rows approximately 6-12 inches apart to allow the air to flow between the stacks. If you're stacking under a lean-to or near another structure, stack the wood 6-12 inches away from the structures wall to allow the air to reach the backside of the stack. If your stack is not under a shelter you can cover the top of the stack with a tarp. Only cover the top and don't rap the entire stack with the tarp. Air needs to flow around the wood to dry it and moisture needs to be able to escape. Wrapping the whole stack without airflow could cause mold to build up and the wood won't season properly. 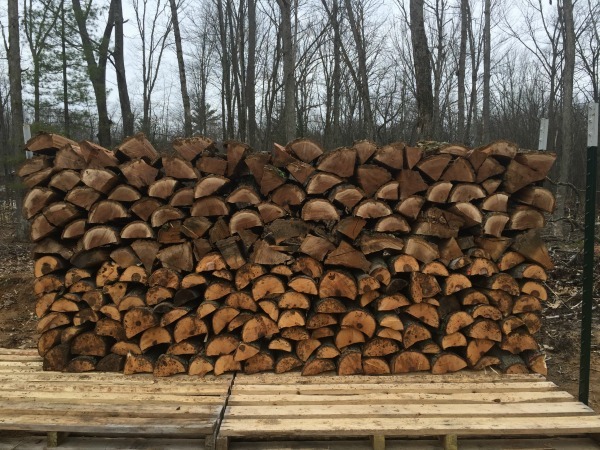 Learning how to stack firewood is not difficult but sometimes it can seem time consuming and repetitious. Taking the time to properly stack the firewood from the start will save a lot of headaches later on.